(CNS): A local lawyer will attempt to fly the Cayman flag atop Mount Everest in May as part of his Seven Summits Challenge, a mission to scale the tallest mountains on each of the seven continents in aid of the Cayman Islands Cancer Society (CICS). Guy Manning, a partner at the Cayman-based firm Campbells, will be swapping his wig and gown for goggles and a parka for the fifth peak in the challenge. The tallest mountain in the world at 29,029 feet, Everest is on the border of Nepal and Tibet in the Himalayas in Asia and remains one of the most challenging peaks for any climber. Manning has already scaled Kilimanjaro in Africa at 19,340ft, while in Antarctica he climbed Vinson at a chilly 16,067ft. In Europe he tackled Mount Elbrus in Russia, which stands at 18,510ft, and in Argentina, South America, he climbed to the top of Aconcagua at 22,830ft. Manning says he will follow a successful Everest ascent with Australasia's highest peak, Carstensz Pyramid at 16,023ft, in 2014, and finally the mountain the peak that has eluded him, North America’s Denali at 20,320ft. He has already made two attempts to scale the mountain situated in Alaska and also known as Mount McKinley. 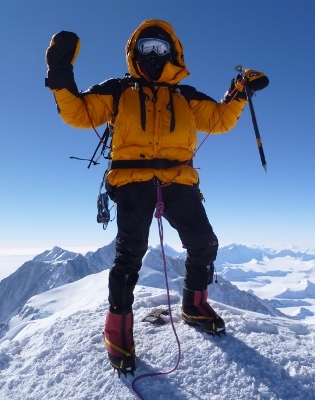 In 2009 he was hit by a storm shortly below the summit and forced to turn back due to frostbite, and when he returned in 2012 his team was pinned down by a storm for 10 days at 14,000 ft. When their food and fuel ran out, he had no choice but to descend. Tragically, four climbers from another team descending ahead of Manning and his group lost their lives in an avalanche. Mountain climbing is no picnic and most who attempt to tackle the world’s highest peaks are well aware of the dangers associated with the sport but more often than not for most climbers the drive to reach the top is far stronger thanthe fears they may have of what might happen. Manning, like others in his chosen field trains hard every week to stay fit enough to endure the hardships presented by his hobby. However, it’s not easy training for mountain climbing in one of the world’s flattest countries and where the highest peak is made out of trash. Nevertheless, short of climbing Mount Trashmore, Manning says he works hard with his trainers with a combination of endurance and high intensity cardio, such as running, cycling and rowing, as well gym-based strength work and more specific training designed to replicate what he’ll be doing on Everest, such as climbing the Camana Bay tower with a 70lb weighted pack. Manning’s Seven Summit challenge is not only about achieving an incredible feat of endurance but also raising funds for a much-needed chemotherapy unit and for 56 local cancer patients currently on the Cayman Islands Financial Aid programme. "Every dollar donated goes directly to our local cancer fight," said Manning, who is paying for the cost of the seven expeditions himself and is asking the local community to chip in whatever they can afford to help the CICS. "There are 56 courageous women and men currently struggling with both cancer and their expensive medical bills here in Cayman and they need our help. As inspiration, Guy plans to take a coded list of the 56 cancer patients currently supported by the CISC to the summit. “It will certainly inspire me, and will hopefully, in some small way, also inspire them,” he added. CICS Operations Manager Jennifer Weber said Manning’s climb is a unique individual challenge, which is not unlike the individual challenge patients face as they battle through cancer. “It’s very touching to know that our patients inspire him and we hope they continue to inspire him once he begins his ascent. He already inspires all of them and we’re truly grateful to him for bringing attention to this important cause. We hope the Cayman community will support what he is doing," she said. Several corporate sponsors have stepped forward, including KRyS-Global Managing Partner Ken Krys, who is himself no stranger to endurance sports as a well-known local ultra-marathon runner. Other sponsors include Exclusive Platinum Sponsor Campbells as well as Baraud, BDO, Cooper Gay, Dart, Deloitte, Ernst & Young, Grant Thornton, KPMG, Netclues, PwC, Ricoh and Zolfo Cooper. All donations are welcome, large or small, and you can learn more by visiting www.sevensummits.ky. Great job Guy! Wishing you all the best! Oh – by the way could you take Ellio and Mckeeva with you? If mac wears his ‘going to England coat’ he could last up there a long long time. What an amazing thing to do. I hope he raises a huge amount of money for the Cayman Islands Cancer Society, it really is a worthy charity and one which needs all our support. Which of us has not had our families affected by cancer in some way? Was there not a previous climber, I believe an accountant, with a last name Hunt or Hunter who also did this? There was his name was Holt Hunter and he flew the Cayman flag on the peak of everest. Either way great luck to this fella as well. Why do you give me a downfist for asking a question? Is it an automatic rsponse to any "Slowpoke" post? what sort of snide comment is that ? Fair play to the man, don't know him personally but he's doing a great thing here, more of an effort than I would make and probably, just guessing, you too. It wasn’t meant as snide, and thanks for the honesty about your lack of effort in that direction, whatever direction that is. Been better if you had just not commented. Good luck to you continuing on being a miserable goat.